In my quest to find the best dim sum breakfast in Singapore, I had to give the dumplings and roasted meat at Red Star Restaurant a try. Red Star serves Cantonese-style dim sum and Chinese dishes and is located at the top of a HDB block of flats near River Valley. It also has an excellent reputation amongst locals. When I first went there one Saturday morning I observed only Chinese patrons and not a European face in sight. There was also a very long queue for a table and these signs made me feel sure it was going to be a fantastic meal. Unfortunately it did not quite live up to my expectation. Visiting Red Star Restaurant feels like taking a step back in time. 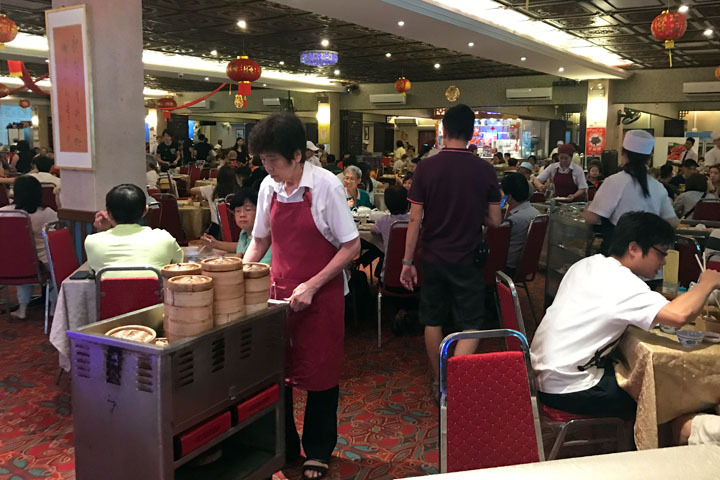 The restaurant is large with gaudy red decor and round tables clothed in white, and they do the old school yum cha trolley service during the day. Trolleys with different types of dim sum are wheeled by and customers can order what they like the look of. 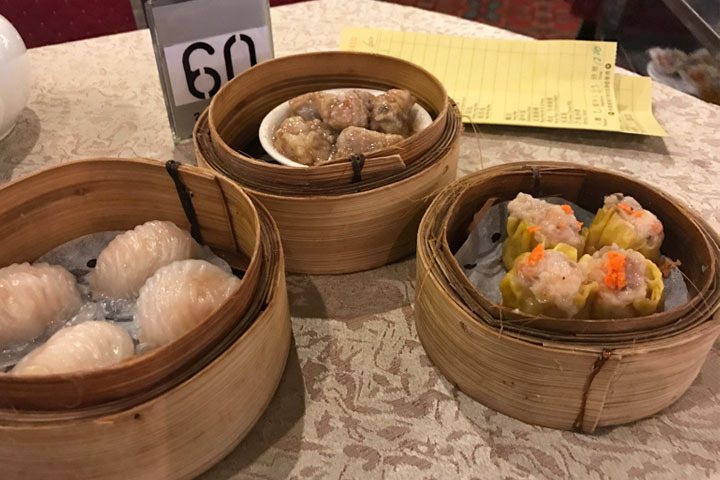 I was disappointed to see most of the dim sum was fried or baked, but there were a few steamed options as well as noodle and rice dishes available. We ordered a selection of the most popular dim sum. We noticed everyone was eating the deep fried and breaded prawns on sugar cane and we assumed it must be a specialty. We ordered a portion but found them difficult to eat. They were very heavy as they mostly consisted of deep fried bread and hardly any prawn. We didn’t want to fill up on these so we cast them aside half eaten. The steamed BBQ pork buns (char siew pau) that came next rectified things and they were one of the most delicious I have had in Singapore. The bun was light and fluffy, which contrasted nicely with the intense, sticky sweet pork filling. Next came the steamed prawn dumplings (har gow), which were decent albeit not as good as Victor’s Kitchen. The filling was generous but it was prawn mixture rather than whole king prawns and the skin was too thick and glutinous. I had so much difficulty trying to remove the dumpling from the steamer using my chopsticks, as it stuck like glue, that the whole thing fell apart! I made sure to extract the next har gow using my fingers to avoid another mishap. The open pork dumplings (siew mai) were more disappointing. The presentation was atrocious with the pork mince bulging out of one wonton wrapper, whilst the crab roe garnish looked like it had been casually thrown on. At least the dumplings were edible. Generally speaking, the presentation of the dim sum at Red Star wasn’t great. 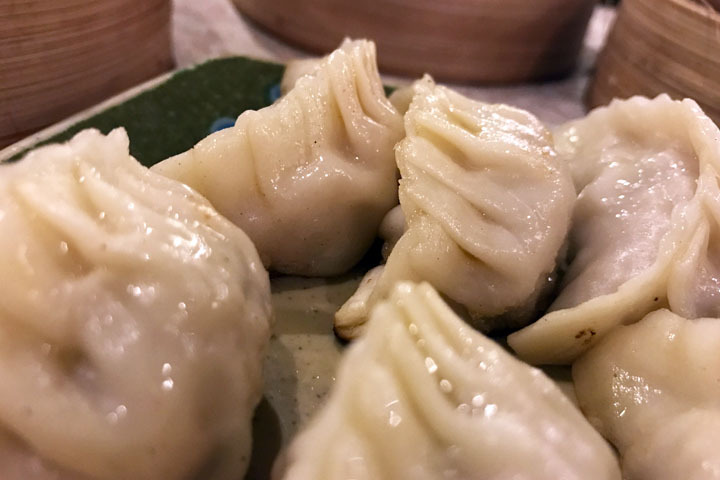 As I observed the trolleys wheeling by I saw the dumplings were all slightly different shapes and sizes, which reflected a lack of care in the preparation. The dumplings I enjoyed the most were the Shanghai-style pork dumplings. 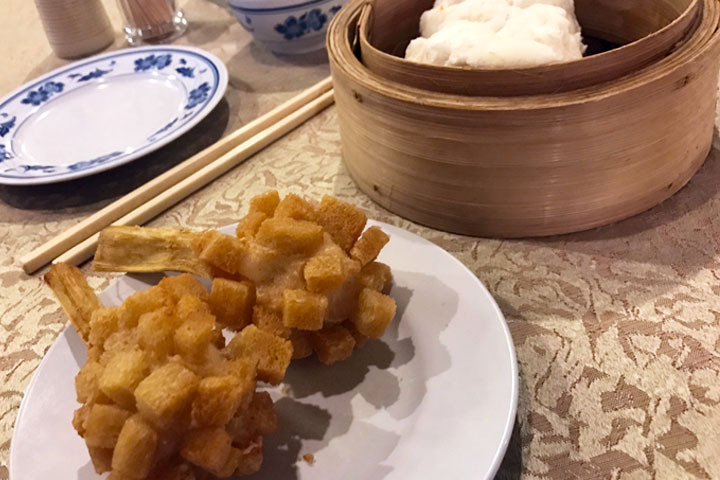 These moon shaped dim sum had a satisfying thick dough that was well steamed and slightly oily – perfect hangover food! We ate them with soy sauce, vinegar and ginger. The highlight of our meal was the roasted duck and pork belly. There is a separate meat counter with a very healthy and appetising array of roasted delights on display. You need to order roast meats from a waitress as it does come by on the trolleys. We tried a portion of roasted duck and pork belly. 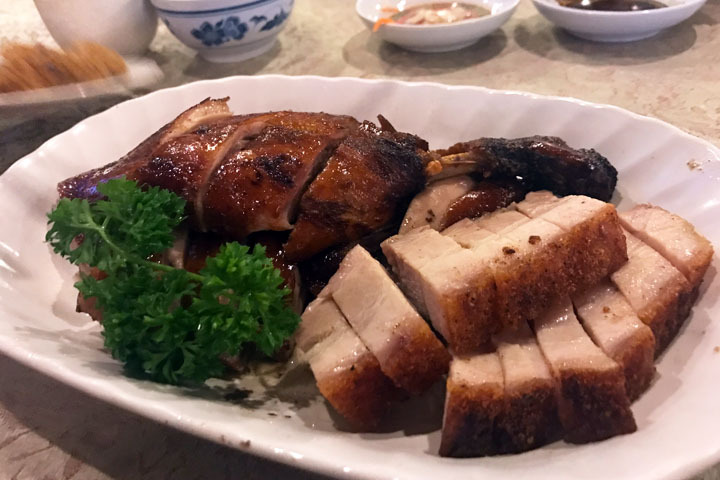 Hands down it was the best duck I have had in Singapore to date. The meat was sufficiently plump and juicy, and the skin crispy and delicious. Likewise the pork was equally amazing. It had just the right amount of fattiness and succulence topped with a very crispy, crunchy layer of skin. Overall the experience at Red Star Restaurant was average. We enjoyed the novelty of the yum cha trolley service but there were too many fried options. Some dishes were really good whilst others were disappointing. 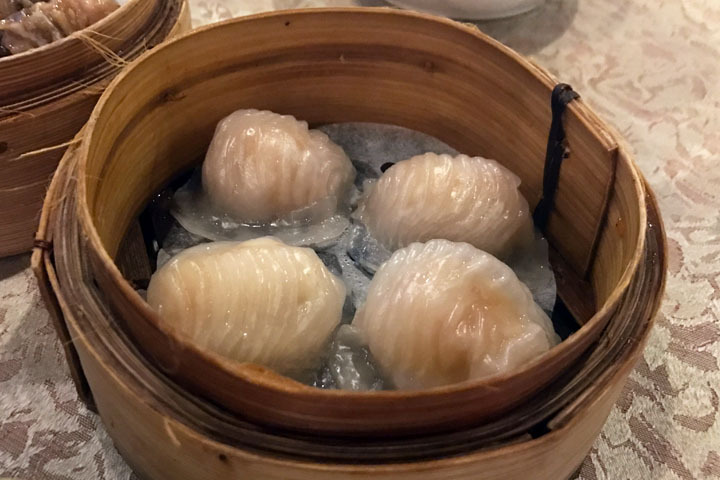 The overall quality of dim sum did not stack up against Swee Choon and similar competitors, despite the higher price tag. 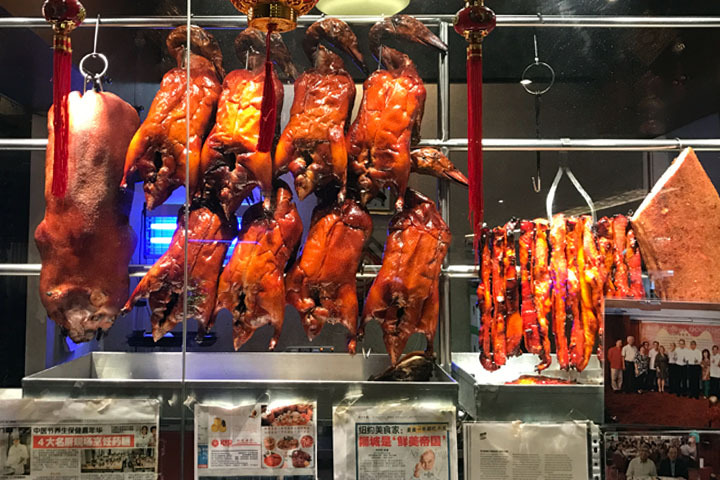 However the roasted meat at Red Star Restaurant was outstanding and I would definitely return for another portion of that mouth watering roasted duck. Love the details you shared about the restaurant’s decor and stuff. The fact that the restaurant made you feel like you went back in time is quite interesting. Great article! Red Star is overrated… have been here a few times because my friends like it. But it doesn’t really compare to other dim sum places outside of the central area of Singapore. Oh man, you know good dimsum when you see them! I love dumplings and the photos you shared just made me crave for some! How do you usually get recommendations for the restos you try, do you just ask around the locals or do you internet research or such?